EA's "FTW" development diary series can, at times, descend into the blandest of marketing buzzword static. 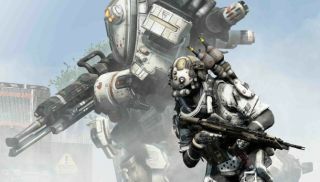 Their latest, for Titanfall, is slightly different - and not just because it concerns the bulky mass of nimble superweapons. In focusing on the arcade FPS's Titans, the game's developers explain their conception, development, and the differences between the three models that will appear in the full release. Beta players will already be familiar with Atlus Titan, designed to be the middle-of-the-road workhorse of the fleet. I'm looking forward to trying the other two; hopefully the more fleet-footed Stryder will further mitigate the difference between the freerunning Pilots and their occasional mecha-pals. Titanfall comes out on March 13th.